Yesterday we spent the entire day (and night) at the Dutchess County Fair! I look forward to it every Summer, and definitely didn’t hold myself back from indulging in funnel cake, deep fried oreos, french fries, and chocolate covered bananas. We occupied our afternoon trying to win oversized stuffed animals, spinning on the ferris wheel (pretty much the only ride I have the guts to get on), and strolling around the luscious fairgrounds, soaking up the late-August sun. To top it all off, Third Eye Blind put on an evening concert where I definitely sang (ok… shouted) my heart out and maybe indulged in one too many sangria slushies. The whole experience was nothing short of Summer magic! Question: Do you like cod? We can’t get enough of it! So let me know if you’d like to see more cod recipes here! 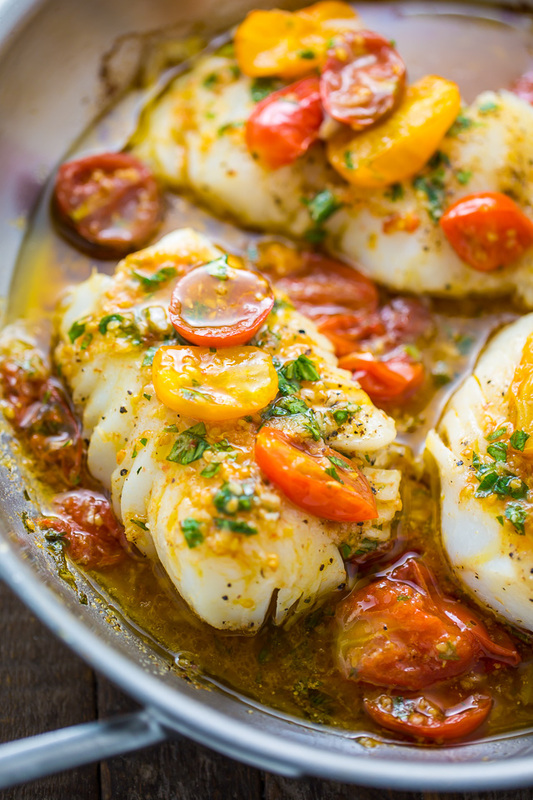 If you love seafood as much as I do, this Pan-Seared Cod in White Wine Tomato Basil Sauce is sure to be a hit in your home! 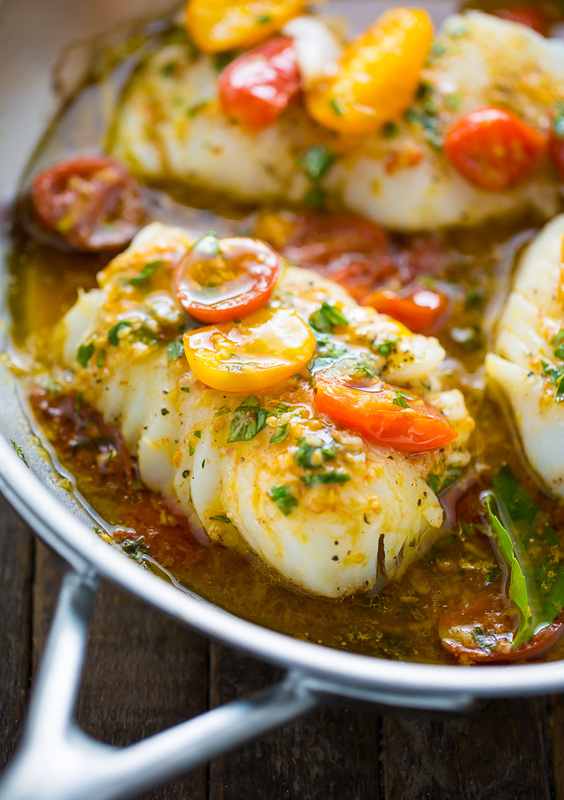 The cod is flaky and tender, and the sauce is so flavorful! Always a hit with the whole family! Heat oil in a large saute pan over medium heat. Add crushed red pepper flakes and garlic and saute for 1 minute, or until garlic is fragrant. 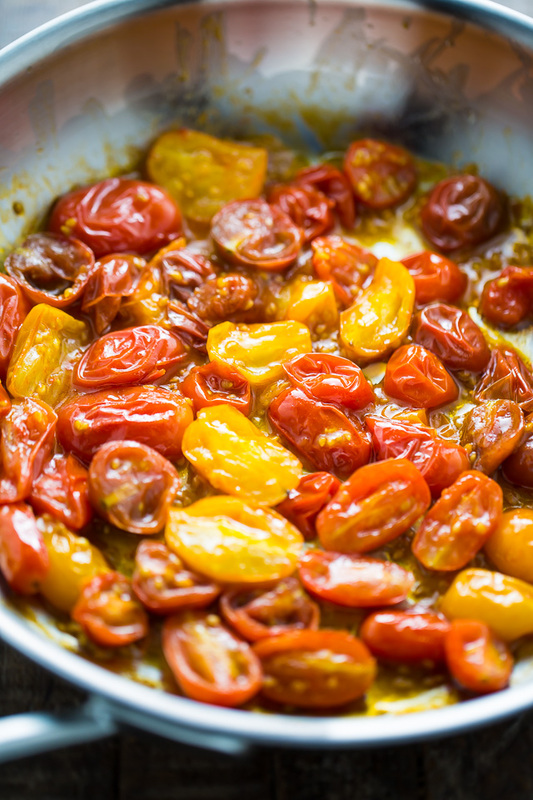 Add the cherry tomatoes and cook, stirring occasionally, until they're soft and blistering, but still hold their shape, 9 to 12 minutes. Add in the white wine, stir, and allow the mixture to come to a gentle simmer. Stir in the basil, lemon juice, lemon zest, salt, and pepper and cook for 2 minutes. Transfer the sauce into a bowl and set aside until needed. Heat oil in a large saute pan over medium heat. Season both sides of cod with salt and pepper. Place cod in the oil and cook until golden brown, about 5 minutes. Carefully flip the cod over and place the pan in the oven to continue cooking for another 5 minutes, or until it's cooked through. This looks amazing, I am going to have to try making this. Thanks for sharing ! Great recipe . I made it for our family and it was thoroughly enjoyed. Very simple as well. I found it a little bland & more work than it was worth/ even my dog wasn’t excited about it. Maybe it was the lack of fresh parsley so I used the stuff from the spice isle. Perhaps try your dog’s food as a comparison, eh? OMG, that was so funny Lee! I’m making this tomorrow for the first time, and I am sure the basil and garlic will give it a lot of flavor! Looking forward to it! The recipe does not call for parsley. Fresh parsley would add a nice touch of freshness, but not a lot of flavor. Dried parsley wouldn’t do much other than add a bit of color. Are you thinking of fresh basil? That would add a good amount of flavor and freshness. Dried basil would add some flavor and color, but definitely not the same as fresh. 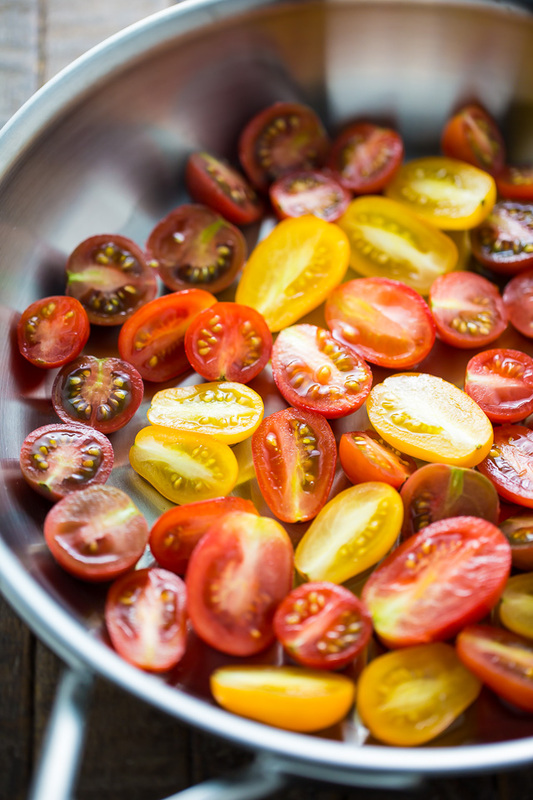 The type of tomatoes could impact the flavor profile as well. The use of dried parsley instead of fresh basil would make a HUGE difference in flavor so i would say to try the recipe again and actually follow the recipe and ingredients as they read before rating again. This fail sounds like an “operator error”. I made this tonight and my husband just about licked the plate. I had some baby spinach in the fridge and tossed that in as well until it wilted. No dried parsley here either. Feesh basil gives so much flavor along with the garlic, lemon, and white wine. YUM! Oops, that’s what I meant. How rude, especially since you didn’t follow the recipe. A good cook improvises and thinks a recipe through and takes away or adds flavors they won’t like in a recipe before making it. You’re clearly not a good cook. Just eat your dog’s food. Maybe that will make you happy. Lol. That’s being a little harsh, don’t cha think? Calm down, for goodness sakes! Yup! I agree of operator error. and tremendous difference in the 2 herbs!!! but some people’s taste is all in their mouth. No distinction of delicious flavor blends. Thanks BAKER BY NATURE. FAB RECIPE. Turns any fish into a gourmet meal. I found Jazmine rice with parsley n a tiny touch of Alpine seasoning a delight under this delicious fish. Icey cold sweet coleslaw kicked off the taste buds. Yum Thanks. I forgot the basil so Isubstituted pesto instead. It was terrific! You must have not followed the recipe. This was intensely flavorful! Delicious! You must be a really bad cook. Either that or you used cheap ingredients. Perfect recipe. Please. Stop the snarky remarks. Why do you need to be insulting? Maybe you needed more salt and pepper. Who leaves comments like that???? It calls for fresh basil, not parsley. Very rude review, particularly if the recipe wasn’t followed. How would swordfish work for this recipe? I have read most of the comments about this recipe. It seems to me that quite a few women have never been in a kitchen before and never should be in one!!!!!!!!!!!!!!!!! wow….it is a recipe some people liked and others didn’t….whatever happened to “if you can’t say something nice, don’t say anything”?? It was amazing! I made it tonight and we all loved it! I will def make it again. Mine turned out perfect. It was very tasty! Loved it! Hi , Just tried this dish and I thought the lemon was over powering , I would use less . This looks so delicious and light! and fried oreos whaaattt??? I need to get on that haha. I have made this before and enjoyed it thoroughly. I’m making it again this evening for dinner and am sure it will be just as wonderful as before. I was shocked how poorly the people behaved that reviewed this post. If are making comments make them either helpful to others or make compliments on the receipe. Everyone has different tastes and adjusting a recipe is fine but bickering online over a recipe is sil.i likes the recipe as it is and will adjust if I ever need . Wait…. why do you preheat the oven?? At the end of the recipe it says to place the pan (of cod) in the oven to continue cooking for 5 minutes. LOL, I completely missed that too! I made this and skipped the oven part and it was delicious!! I’ve made this many times with several kinds of fish, also added balsamic vinegar and put mozzarella on chicken filets.. excellent! i wonder the pan have to be made for the oven… but if it is non stick one? I was thinking the same, did I miss something!? Does it have to go in the oven? The pans I have are not oven friendly. It sounds like other readers have had success just cooking it on the stove top, so I think adding a few extra minutes of cook time should work! I left mine in the pan, it was delicious. Can you make the sauce ahead of time and reheat it when ready to cook the cod? Thanks Lynnia for letting us know that Tilapia will do just fine as in neck of the woods, we do not get cod either frozen or fresh. I was wondering that too as the oven does not seem to be used! LOL. I thought the same thing Lilly. No need to preheat oven I guess. Actually warming up fresh bread in the oven to dip in the delicious tomatoes is a great idea. Sandy, you just gave me a great idea! Crusty bread, goat cheese and this tomato sauce on top! Sort of a bruschetta! This dish was honestly fabulous! The oven is used in Step 5. Sorry, I was wrong. You do need to preheat oven for step 5. I totally missed that. Because if the oven doesn’t heat up to the right temp it could under cook the dish. Serious question do you usually use the oven when cooking? Just wondering because you always have to preheat the oven if not it could really ruin the dish. Especially when baking! Heating temps are very important when baking also!! Since I had to heat the oven I roasted Asparagus with the fish. I put the Asparagus in when I started the fish on the stove top and both the fish and Asparagus were done at the Same time. Great idea! I picked up some asparagus to cook with mine even before I read your comment. Making this tonight! When you flip the fish you’re instructed to finish it in the oven. I said the same thing. Huh? What?? Hi Chris. What are you confused about? I’d love to help! what is the point of heating the oven? Plan on making this tomorrow. I will report back, it looks fantastic! Made this for dinner tonight. Served it over brown rice with steamed broccoli. I used swordfish instead of cod because it was on sale and looked yummy. I love the spice the red pepper flakes add to it. I will definitely make this again. I made this tonight for dinner for my husband for Valentine’s Day. It was so delicious. He loved it so much. Thank God I made enough for his lunch tomorrow. One of the easiest and best recipes I’ve ever had. Don’t have lemon zest (just lemon juice in the bottle). Is that OK? Also, I have lots of garden tomatoes (not cherry). Can I cut them up to use in this recipe? This dish looks incredible. I can’t wait to try. Thanks for posting. This looks amazing – I’m making it tonight. Do you think this recipe would also work well with Tilapia? Hi! I’ve never tried with that variety of fish but I think the flavors would go lovely with it! You may need to adjust the cooking time by a minute or two. Am I going crazy or not once does the fish go in the oven. Why am I pre heating it if not in use? Hi Ella. Step 5 instructs you to carefully flip the cod over and place the pan in the oven to continue cooking for another 5 minutes, or until it’s cooked through. Made it for dinner tonight. It was really good, used 800 g of fish and it resulted in 4 servings. I would have liked some ore sauciness, maybe add some cream, chop the fish and let it boil in the sauce. I used frozen cod that I had in room temperature for half a day, worked perfctly! Did not put it in the oven, it got fully cooked in the pan. Made this tonight, it was fabulous. I had something else in the oven at 425* so I only cooked it in the oven for 3 minutes, came out perfectly done. Sauce was great. Will make this again! I am making this tonight! Will have to skip the oven part though since my oven went out last week 🙁 But I am sure it’ll cook up just fine in the pan. This was yummy! I used flounder which was very thin, so I cooked it right in the sauce. Can’t wait to have the leftovers. This is a fabulous recipe. The flavors are amazing. I made French bread with garlic and herbs. Great meal! Thank you for sharing. I will make this again. Hi Dianna! I’m so happy you enjoyed it! I have to try pairing it with garlic herb french bread next time I make it – sounds so good!!! My daughter made the cod recipe for our Sunday group dinner/game night. It was a fantastic dish! The recipe is in my “keep forever” file. Loved it. I will cook the sauce for other dishes as well. Thanks. The sauce was wonderful! Just enough heat with the red pepper flakes! Party in my mouth! thank you for sharing! Does anyone know if this reheats well the next day for lunch? Made this last night and posted a pic on IG immediately! It was delicious but I have to admit that I didn’t use the oven; I cooked it entirely in the pan. Turned out great and my husband loved it! This recipe is a keeper. My husband and I loved it. Love it!! I want it everyday for dinner! Thank you! Made this last night. Wife and 17yr old son both loved it, as did I! Super easy and light. Thanks for posting (sorry, pinning) this, it’s a keeper! 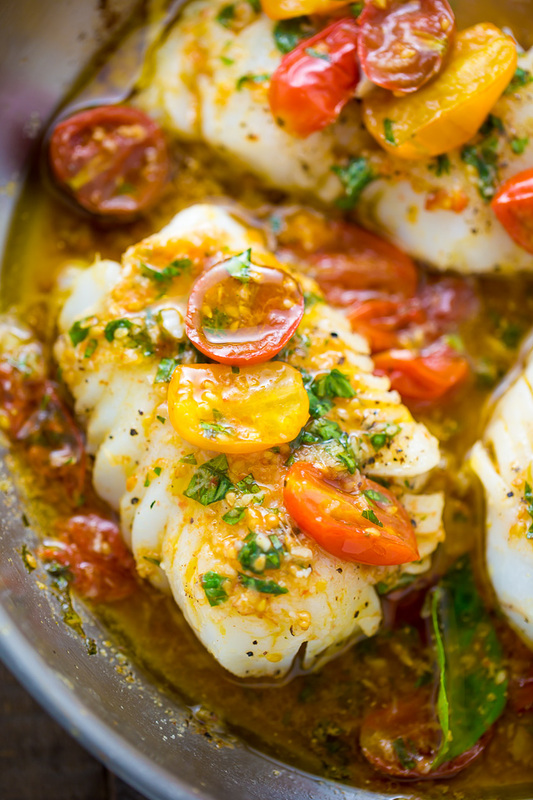 I found this recipe on Pinterest (now saved), its perfect for us as we get the freshest caught cod and beautiful locally grown heirloom tomatoes. Personally I make the sauce then add the cod loin as is and let it steam for 15 minutes, its sooo good and flakes beautifully. And as an aside you can indeed use frozen fish, cooked the same way its perfect. Delicious – made this last night and we had it over mashed potatoes with some green veg on the side. Didn’t have fresh basil so used dried instead and then finished it off by putting lid on pan and leaving it for five minutes….definitely a keeper!!! How much dried basil can you use in place of fresh? #1 you can use just about any fish- even chicken works well with this sauce. #2 if you don’t have oven friendly pans, cover the fish after turning and it will help with final cooking and will keep it juicy. #3 you suggest using a non stick pan and show a stainless steel pan. I bit of a contradiction. If a good stainless steel pan is heated before adding the oil and the fish is allowed to seal (Maillard effect) you should be able to lift and turn the fish without breaking it up. #4 I would cook the cod first, remove it a plate and cover, then make the sauce, which will have a lot more flavor after cooking the fish in the pan. All based on personal experience. Thanks for your feedback, Sharon. I’m glad you enjoyed my recipe. Absolutely loved it!! Will be put into the dinner rotation!!! I made this for dinner today. It was a smash hit with the family. I served it with white rice and black beans. Would swordfish be good in this recipe? I made this, and it was delicious. I baked my fish seperately and poured the sauce on the cod afterwards. The recipe for the sauce is amazing! Colourful, delicious and quick and easy to make. I have made it twice already and it is a winner!!! Can we replace the white wine with anything else? Can u mention something to replace it with ? We cooked this tonight. Made entirely on stovetop. No need to put in oven. Flavors were very good. Husband really liked! It also cooked up faster than recipe indicated. Maybe my fish pieces were not as thick. I recommend this . Hi, I’m going to try and make this in English measurements tomorrow!! Can I ask, are red pepper flakes the same as red chilli flakes? Thanks! This is the bomb! I haven’t found a recipe, except fish and chips, for Cod that we liked. My 16 year old son, who mainly eats pasta or California rolls, actually devoured this! I cut the lemon in half and omitted the zest because my husband loathes lemon/lime. He couldn’t tell there was any lemon and loved this dish! This is definitely a recipe I will use frequently as I am trying to cook more fish for my family rather than beef and pasta all the time!! We had this tonight and it was fantastic! I will definitely be making this again. The only change I made was to sear the fish, remove it to a plate, make the sauce as directed, then add the fish back to the pan with a lid and let it cook in the simmering sauce for 7-8 minutes. I tried this dish for the first time and once I taste tested the tomato basil and white wine sauce I knew my husband and I were in for a real treat!! OMG this beat any meal at a fancy restaurant. I used frozen cod and it worked perfectly. I served it over a bed of fresh zucchini “noodles ” YUMMY, Thanks for this great recipe. I plan to serve this over a bed of zoodles as well but I am slightly concerned there won’t be enough sauce to coat them. Did you find there was enough sauce or did you add anything to make it a bit more saucy? I made this dish last night and served it over mashed potatoes. MY ENTIRE FAMILY LOVED IT!! Can’t wait to cook I think again!!! This dish was a HUGE hit – it will become a “go-to” recipe. Absolutely fantastic. Best recipe yet from Pinterest! Simple to make and tasty, I love it. Thank you for sharing your recipe. Yummy!!! Delicious!!! I made this tonight and served it over mashed potatoes and the flavor was out of this world. The flavors and texture was soooo comforting!!!!! OMG! This was amazing! I added, mushroom, onions & peppers and served on top of mashed potatoes… fabulous!! This will definitely be one of our monthly dinners!! I made this recipe this evening to the directions and it was so good!! Served it with green beans and they went so nicely with the sauce as well. Next time I make (and there will be a next time) I’m going to add some artichokes and capers for a Mediterrean twist. My husband and I loved it. I did not put in oven, but I covered it after I turned it over. It was awesome! 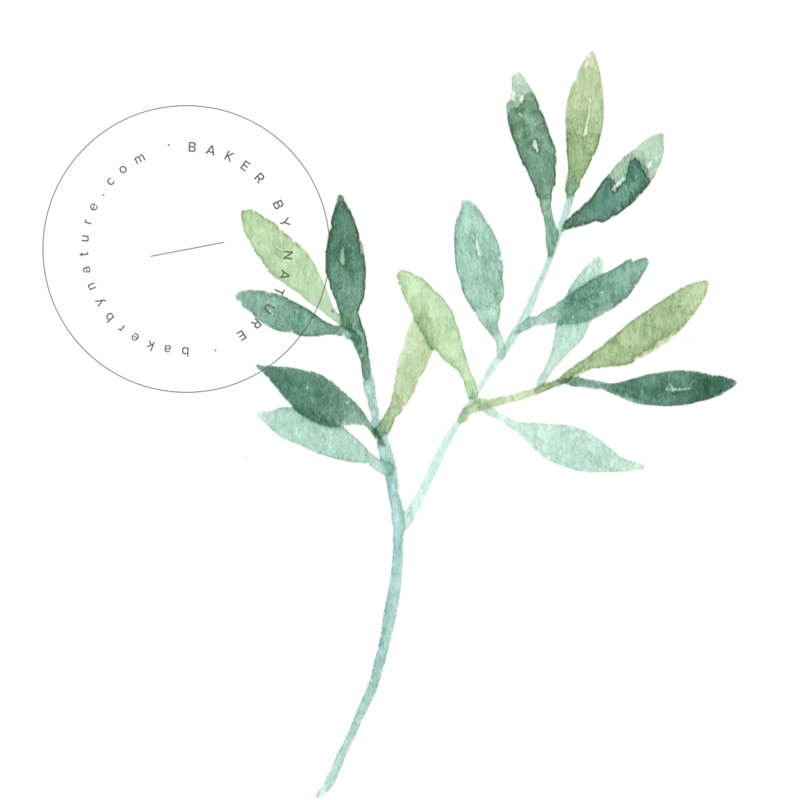 What can I use as a substitute for white wine? I’m making this for dinner tonight and don’t have any on hand. I had chicken stock on hand and it was so good, also I finished cooking the fish with the tomato basil sauce in the oven that gives the sauce some fish flavor which was great. Wow! Flavor is phenominal! Just a try out for myself but will definately make this for compsny. I have made this 3 times now. My people now think I am a cooking godess. Excellent recipe. Thank yo for making me look good! This is a very pretty dish, the sauce was flavorful and delicious. I shouldn’t have used cod though, for me, it is a fish that is best used for fish and chips. I would use tilapia if I make it again. Thanks for sharing the recipe. Hi Crissy. I’ve also heard this goes well with swordfish 🙂 Glad you enjoyed the recipe! Made this last night and it was great! I had to use tilapia because they only had frozen cod at the store and I wanted something fresh. 🙂 (FYI – I cooked the tilapia basically the same way, but it fell apart a little more easily than cod likely would.) I doubled the sauce and reduced the tartness some by adding extra wine and a little butter. I also seasoned the fish with Sazon instead of just plain salt. Served over seasoned sauteed zucchini/ summer squash noodles. Everything was perfect! Thanks for the great recipe! I agree Kitty. Looks great, easy to cook but the great fresh flavors are swamped by the heat. Going to try again with a pinch of pepper flakes, looking forward to it! This is not my go to fish recipe! Amazing and simple. Thanks. The tomato topping was delicious on the fish. I baked the cod the entire way instead of searing first to help get rid of some of the fat. The family loved the recipe. Thanks for sharing. I always print out my interest recipes (so I don’t have to hassle with the phone or tablet going blank), and after I’ve tried the recipe, I rate it on the print-out. The highest score has been “primo”. But this one got a notation that said “Waaaaay better than primo! This was breathtaking!” Thanks for the amazing dish! I read this like 12 times trying to figure out why I needed to preheat the oven…. Came out even better than expected! My boyfriend loved it and he thought it was better than a 5 star restaurant. The only thing I would change is less crushed red pepper. When you heat it in oil it brings the oil out in the pepper and intensifies the spiciness. After reading all these glowing comments, I can’t wait to make this dish! Thank you for posting it! I absolutely LOVED this!! It’s allergy friendly and friggin loaded with flavour. I didn’t alter the recipe at all, however, my fish was frozen and thawed when I cooked it and you’d think it was fresh. Thank you so much for sharing this fabulous dish! I made this today and it was really delicious. I generally am not a fish person, but I will be making this often to fit fish in my diet. Thank you for sharing this recipe. Fabulous!!! Will definitely make again! Why did we preheat the oven? OMG! amazing!! My husband wants to start eating more fish but I am not a huge fan. I have made so many recipes I didn’t care for BUT this one is a keeper!!! I bet the Thai basil was an amazing addition!!! WOW! This is YUMMY!. I used frozen Cod. Thawed it first then cooked according to directions. Made up some linguine, tossed with the wine tomato sauce then put the cod on top. This was delicious! I made this using 2 eight ounce, thick, cod fillets with no change in amount of sauce. I seared in pan 5 minutes and then cooked for additional 10 mins in 375 degree oven and were cooked to flaky perfection. Served over zucchini noodles! If you would continue cooking the code in the pan instead of moving it to the oven, how much longer would you cook it on the opposite side? Made this dish tonight. Presentation is beautiful. Served over Basmati rice and sautéd spinach. Followed ingredients exactly. Will make again, but 1/2 tsp. of crushed pepper flakes was over kill. I love spicy/hot dishes, but it completely masked the fresh basil and lemon. Would probably leave it out altogether, nextime. Holy heck! I just made this for lunch. I poached the cod in the sauce vs searing it alone in the pan… FABULOUS… the sauce has so much flavor. Definitely making again. This is fantastic. I will make this again. I’m making it for the 2nd time tonight served over quinoa and a side of steamed broccoli! Great recipe and healthy! Why do we need to pregeat the oven for this recipe??? I plan to try it, but just wonderin. Why do we need to preheat the oven for this recipe??? I plan to try it, but just wonderin. Made this tonight for our friends in France and it was a big hit. Will be making it again!! So happy to hear it, Cindy! Made this today – it was delicious- served it with zucchini ” fettuccine ” – this recipe is a keeper! My family is obsessed with this sauce. We enjoyed it over scallops. Will make again – but double to sauce. Thank you!! Used frozen cod–thawed it according to package prior to cooking. Definitely a keeper thank you for this wonderful recipe!! I’ve now made this recipe three times. Today, I tweaked it by marinating the cod for several hours in ponzu sauce into which I’ve squeezed the juice of half a lemon and half a lime. I’ll serve the dish over brown rice steamed in a mixture of water and home-make chicken bone broth. great recipe. try toasting some panko breadcrumbs in a dry pan. Finish off the cod dish with a sprinkle of this bresdcrumb! Gives it a little snap ! My husband cooked this fish over the past Memorial Day weekend. It was delicious!!! I see comments that it’s also good with chicken. Will try that another time. Made this tonight. I used scrod instead of cod. My husband and I love this recipe. We’ll definetly make this again. Made this last night. It was delicious and so easy! Thank you for the recipe! I see others were also confused about the need to preheat the oven. Then I went back and read “step 5” which directs you to put the pan in the oven after you flip the cod. However, you were specific about using a nonstick pan..but you can’t put a nonstick pan in the oven! This was soooooo good!! I had used Haddock instead of cod! I found the tomatoes n wine were quite acidic so I added sugar to counter that! Served this with rice pilaf n French green buttered beans! Wow! Is all can say! It was delicious and simple, Optional yu can add some sautéed shrimp to further the meal! Also added some smoked paprika to the shrimp to add flavour n zest! Definitely repeating this recipe! 1. Fresh COD makes a huge difference Vs frozen! and easier to work with too. 3. Yes, NON-STICK pan is a MUST! and besides just salt & pepper, I also pour some fresh squeeze lemon juice on the fish before cooking, it takes away that fish odor. 4. The tomato sauce with fresh Basil was a bit missing of something … so I added a pinch of Italian seasoning, a pinch of thyme, a pinch of dried rosemary, and dust of cayenne pepper … this gave the sauce that thing it was missing. 5. Served it with butter charred asparagus, option of baked potato (one child does not like asparagus) and wild rice …. And it was Wow, Just Wow … Kids Loved it! Absolutely delicious and super easy for an after work healthy meal! Served with a bit of angel hair pasta and a yummy salad with balsamic dressing. I did not use the oven at all. I browned on one side in the pan then flipped then added the sauce on top of fish and cooked it off in the same pan till fish was firm. Thank you !!! I made this earlier in the week, but used catfish instead. LOVED IT! My husband must have said, “This is awesome!” at least three times. It’s a keeper. I have to try it with catfish – sounds amazing! This dish is absolutely delicious, we love it! I’m so thrilled this was a hit for you, Jennifer! Why did i turn on the oven? This was really amazing! Great flavors and super easy to make. I didn’t have cod but used some fresh Texas redfish my dad just caught and pan seared it 4 min on each side. No oven because it’s too hot to turn it on! Good call on the rice. I served with sautéed broccoli and brown rice. I’ll definitely make it again! Work. And I got excited when I’m read the first line about the fair. I was there that night too. It’s odd to find a blog by someone here lol. WE should do recipe testing lol. This was phenomenal. The flavors worked so magically together. Easy, delicious and can’t wait to make it again. The family loved it!! Thank you for this recipe!! Hello there, this recipe looks amazing, however I don’t care for tomatoes when then skins come off. I find they are hard to chew. Can other tomatoes be substituted? You could try chopped tomatoes, but I’m not sure the sauce will be the same. Love, love, love this recipe! It was easy to follow, the flavors were so fresh, vibrant and absolutely delicious. Husband loved this dish! This dish is delicious every time. The only thing is you say to pre heat the oven to 375 but then you say to cook it in a pan 5 minutes each side. Maybe I didn’t understand it. I wanted to post a pic but this site wouldn’t allow it. why u need the oven for this dish i didnt get it? Very very good, I will make it often. But 12 min for the tomatoes is not much, I would say 5 min max. Absolutely wonderful. My new favorite fish recipe. This was delicious! Loved being able to use my fresh tomatoes and basil from the garden. It was too hot to turn on the oven so just finished it in the pan. Served it with fresh peas from my garden and mashed potatoes. Thanks for sharing this masterpiece! i skipped the oven part and cooked fish using the stove only. 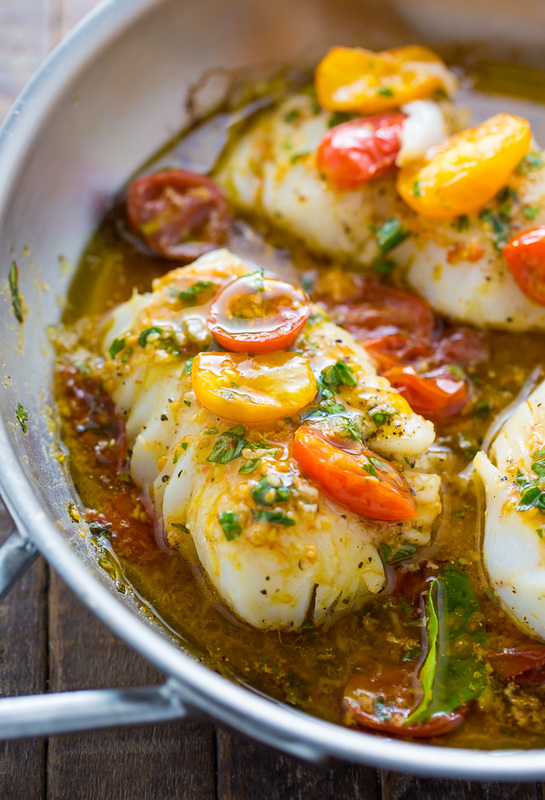 What do you think about Pan-Seared Cod with Preserved-Lemon Aioli? Thank you SOOOOO MUCH for this recipe! I made it with both cod and chicken this week. It is probably the BEST thing i have ever made!!!! I didn’t transfer to the oven because I didn’t have the right pan, but it was so good. I ordered the right pan now. :) I never post comments, but you so deserve it! My husband and I simply fell in love with this recipe! We both enjoy, no love, fresh and flavorful food, especially seafood. You truly hit the ball out of the park with this one!! Without fear of “too much of a good thing”, we’d both love to have this once a week but don’t because we love it too much and do NOT want to chance growing tired of it. Thank you for creating this scrumptious offering! I was looking for a way to change up my typical cod recipe and this was just the trick! Amazing recipe thank you for sharing!! This dish is as absolutely delicious…I enjoyed every morsel! Awesome recipe – very flavorful and now that I’ve done it once, it will be easy-peasy next time! Thanks so much for sharing. I made this tonight for a family birthday and it was a huge hit. I used thawed frozen cod and it was perfect. It is super flavorful and fresh tasting. I served with roasted potatoes and green beans. I just did the fish in the pan entirely and skipped the oven step. Highly recommend. Made to today and it was fabulous will be making it again and again. Thank you for the recipe, it’s delicious. The picture just made me hungry! LOL – This looks so good. Thank you for sharing how to make it. What can be substituted for the wine? I have made this recipe for years, but use leek (white part only) either julianned or diced instead of the garlic. Delicious. The leek makes the whole house smell fabulous! Wonderful with mussels instead of fish too…just add chopped Italian parsley to finish. The first time I made this dish I followed the recipe to the t and it was delicious! The second time I mad this I had to mix things up a bit I didn’t have white wine so I used white vinegar instead it was delicious as well also I added beets to the sauce because they had to be eaten and made the dish even better! I made this for my church banquet for 125 ppl(yes125ppl). but sense i was cooking a large amount i didn’t sear it I baked the cod and everyone loved it especially my pastor. Will definitely be making this again. I made this for my wife for date night. It made me look like a gourmet chef‍. I followed the directions to a T, and it came out perfectly. Thank you. Perfect time to repost this on IG as I’m trying to plan Friday dinners for Lent! Is there something I can replace white wine with? Made this last night with steamed asparagus and baby potatoes with chive butter on the side. It was good. Either I like to smother stuff in sauce or my tomatoes weren’t juicy (used the colorful ones as in the photo), but there definitely wasn’t left over sauce in the pan. Barely enough, i’d Say. I’ll make this again but probably double the recipe for the tomato sauce that goes in too. Omg hands down one of the best recipes I have ever made from Pinterest!! I served it on top of zucchini noodles and it was delish. Loved the mix of light flavors. I used frozen cod and it still turned out wonderful. With the exception of the fish these ingredients are almost always on hand, that to me is a good recipe. I think I would like to try substituting the basil for some tarragon to mix things up but only because I have so much of it growing right now. A silly question: Why I preheating my oven to 375 degrees? This was a a great dish! So easy to make and very favorable. Thanks for a great recipe. Tasty! Why am I preheating my oven? Am I missing something? Thanks for sharing this recipe! It was absolutely amazing the flavor combination! My 6 year old grand daughter requests it at least once a month. Just made this for dinner. The fish came out very good but the sauce had too much of a lemon taste which overwhelmed the dish. I think a bit less lemon and more Italian seasoning may be the trick. I will try it that way next time. Made this tonight for my husband and I. It was amazing. Your hints and suggestions were very helpful, particularly with time to cook the Cod. I make alot of fish, but first time I have cooked cod. My sauce did not look as pretty as your pictures, I think I might have stired the tomatoes to much, but the taste was excellent. I served it with a cheese and broccolini risotto. This is now going to be a go to recipe for me. Anxious to make for my kids when they come home from college. This was so easy to make and went very well with a cilantro lime rice also available on Pinterest. You and your family will love the combination. Give it a try today. This was absolutely delicious! It turned out perfectly. Restaurant style dish. That’s for sure! Thank you so much!! I will definitely make it again and again! I made this dish tonight and it was delicious. However, I felt like my sauce was too think and I didn’t have enough to put over my rice. I followed the directions exactly. Wondering what I could do next time? So yummy! I served this with cous cous and oven roasted asparagus (cooked it while I made the sauce). Amazing! This cod is amazing!!!! I’ve been making it once a week for the last month!!!!!! Absolutely delicious and easy. I definite do again. Made this tonight I don’t like fish, but this was really good. I used grouper. Definitely a keeper. Thanks. Great recipe. I served it with white rice and beautiful, fresh Ontario asparagus. This recipe was wonderful. I didnt have fresh basil, but I had some basil pesto, so I substituted and used that and I had two large whole tomatoes that were ripe and needed to be eaten, so again I substituted. The recipe came out so good. I will definitely be making this again. I made this for dinner last night and it was absolutely delicious, I followed the recipe exactly, except I did add a couple pats of butter to the sauce for richness. I have a thing for butter. Will definitely be making this recipe again. I just made this and it is DELICIOUS!!! Loved this recipe. .. Had no fresh basil or garlic as I wS at the cottage BUT made a few changes and it worked out fabulous. … We loved it….thank you. I had an entirely different meal almost ready to go tonight when I discovered my steaks were frozen solid. I quickly Googled for a healthy fish recipe and this one came up. It looked so appetizing I knew I wanted to try it if I had all the ingredients. I used thawed frozen cod fillets which worked out just fine. I was heavy-handed with the red pepper flakes and lemon juice, and used our first crop of Fresh Garden tomatoes and fresh basil. since my basil was rather skimpy I also sprinkled a bit of extra dried basil into the recipe and since I like my food spicy I threw in a few fresh green onions as well. I seared the Cod very quickly on both sides and then cooked it all in the pan for about 5 more minutes which was absolutely perfect I served it over quinoa that I had stirred some of the sauce into before layering the fish on top of it with more sauce spooned over everything. it was extremely delicious. I loved it as did my whole family and we will definitely be making it again. one extra note: I always boost the flavor of my quinoa by adding additional seasonings to give it some extra punch. I used a bit of onion salt, garlic powder, dill weed, salt and pepper, seasoning salt and green onions. You can also make your quinoa with chicken or vegetable broth to give it a bit of extra flavor in Savory dishes as well. I know it did nothing but enhance this fish recipe and I promise you it was all just bursting with flavor. This recipe is a definite keeper! Thank you. Hey! August 24th is my birthday! How perfect! I made this tonight after a grueling mountain bike ride with my birthday twins, who are also twins. It was sooooo delicious! I forgot to pick up a lemon, which I imagine would really set off the tomato and garlic really well. Thank you for the wonderful recipe! I finally tried this recipe I’d saved in my Pinterest recipes forever ago and it was fantastic! I served with a wild rice and fresh green beans and everyone loved it. I followed the recipe exactly and would change a thing. So much flavor with lovely fresh ingredients. It will become a staple for me. I am not a huge fan of fish, but the picture and ingredients enticed me. I tried it out tonight and used dried basil as that was what I had. I followed the remainder to a ‘T’! Very good, but a little spicy for my liking, but that is obviously a personal preference. Will definitely make it again. Can’t wait for the leftovers for lunch tomorrow. Whoever said this was bland must not be a very good cook because this was so packed with flavor and delicious, everyone at my dinner party loved it and there was none left!! This was wonderful. Made this for lunch for my husband and I. It was the perfect combination of flavours. I used snapper and omitted the red pepper flakes. I ate the leftovers for dinner served over a wild rice/quinoa blend! 5 stars! So happy you enjoyed it, Laura! Butter. The lemon and red pepper was coming through really strong, and cutting it with a small dollop of unsalted butter made it absolutely perfect. Thanks for the recipe BBN! I made this to do a good demo in my store. It was absolutely amazing and everyone who tried it loved it. Thank you! O.M.G. Thank you for sharing this awesome recipe! I made it for dinner tonight., and I’m so happy I have leftovers! The only thing I did different was to add the garlic after the tomatoes were done so it wouldn’t burn, omitted the red pepper and used dried basil. This is definitely a forever keeper! This was fabulous! I have a guest that can only eat fish and she loved it. I surprised myself and loved it too. The sauce had a lot of flavor. Good stuff! Made last night with fresh red snapper, shrimp and fresh green beans. Added an extra squeeze of lemon at plating. We shared the leftovers for lunch today and I might say it was even better! So yummy! Thank you. Ok… so for those that complain about lack of flavor… you got fresh basil, lemon zest, garlic, lemon juice…. need I say more? I made this tonight and it’s amazing. Thank you for a great recipe and for the haters…. maybe just stick with frozen pizza, cause apparently you can’t cook. This is so nice. Refreshing change from crumbed or battered fish. Flavor plus really enjoyed it. I served it with rice. Excellent recipe! I’ve made this twice now and all I can say is: Make it!! Stop saying it looks great–make it!!! The first time I had issues with the cod sticking, but it still tasted fantastic. Tonight I made it again but poached it in the tomato/wine sauce and it was amazing. This is so good. A keeper!! Is there a specific dry white wine you like to use? Or any? absolutely delicious! sharing with friends. so good. 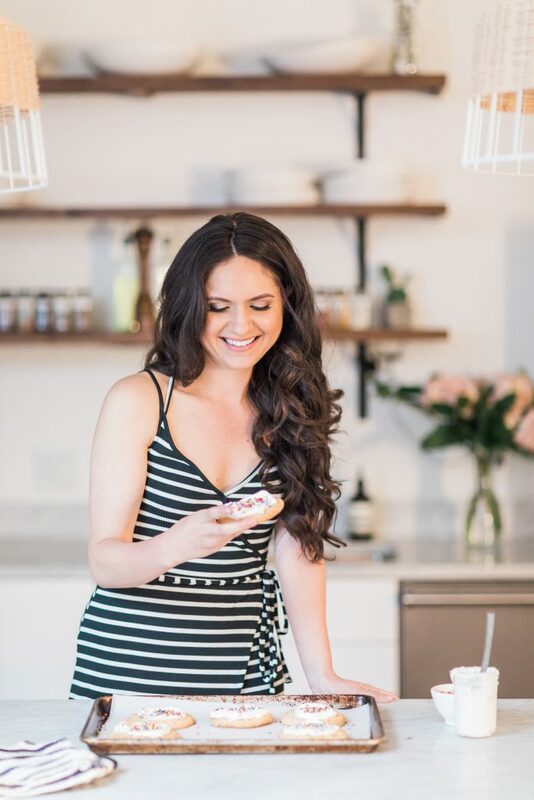 I love this recipe, have made it many times for both meal prepped lunch as well as random weeknight dinners. I serve this with a cilantro lime rice and about a tablespoon of green olive tapenade and it’s absolutely delicious! What is a pint of tomatoes? Is it 500g? Made this dish tonight and it turn out just like it looked and was delicious!! I added spinach and used less fresh basil. I was glad I did because I think the 1/2 cup of basil would have been too strong. Served with rice on the bottom. Will definitely make this again. Delicious! Used fresh caught redfish from Lousiana instead of cod and Chardonnay as the wine, served over brown rice. Turned out perfectly! The sauce was amazing and could easily lau with pasta, or chicken, if you ask me! I have tried to make fish for dinner several times and they have all been epic fails. I love to cook, but fish is not my forte. This recipe was SO good. My husband even cleared his plate – and he is a steak and potatoes kind of guy, not so big on fish. The flavor is great. I used Oyster Bay sauvignon blanc (which is my personal fav.) as my wine choice. I also went for the multi-colored cherry tomatoes and they were delicious. I will definitely make this again. Thank you! The sauce taste really good, we finished it all with the steam rice. Thanks for sharing! Amazing dish!! I used the fresh basil from my aerogarden and a super high burner on my stove to cook the fish so never put it in the oven. Turned out great! The combination of the lemon and tomatoes is wonderful! Thank you! I never comment on recipes but this is AMAZING! So flavorful! Will be making over and over again. Oh! Pesto would be good too. We are currently staying in Spain, so I have been looking for recipes that I can make with limited kitchen utensils and utilizing fresh, local ingredients. I am not a big fish fan, so my rating of 5 stars for this recipe is more like a 10! I made as written, except I over estimated the 1/2 tsp. of crushed red peppers (lack of measuring spoons).. Other than being a bit too hot, it was absolutely fabulous! The lemon juice complimented the tomatoes beautifully. Will definitely be making again and will probably add to the regular rotation once we are back home. Made this tonight. Delicious!!! My husband doesn’t really care for fish. He loved it. Told me I could make it again. Absolutely delicious I doubled the sauce and poured it over linguine. Yum yum so good. Thx for sharing. This was so delicious! I will definitely be making this again. I just made it today, and it was SO good! So flavorful, simple, yet sophisticated. Even my mom- who has a really bad cold now, and claims everything tastes like cardboard- said it was delicious;) you should share more savoury recipies! This recipe is delicious, I made it for the first time for me and the other half and we both enjoyed it very much. I did not have pepper flakes but used chilli flakes instead and still tastes amazing! This looks delicious! I can’t wait to try this recipe out! This recipe is simply delicious! Quick, easy, and full of flavor! I tried the recipe about two weeks ago and I always add to what the recipe calls for and the sauce was amazing but We didnt think it went well with the cod fish. Perhaps it my the thickness of the cod but I feel this would go well with thinner fish such as snapper. Thanks for the Recipe I will use it with a different type of fish. Delicious! I added sea scallops also. I love garlic so I added a few more cloves . I also added fresh parsley to the sauce . Like everyone said It’s truly is amazingly delicious and I will also agree that next time I’ll put a smidgen of crush red pepper flakes, kids and hubby likes spicy dishes but 1/2 tsp is too much. Two thumbs up for this recipe! This was delicious. My husband, who does not like anything new, loved it. So quick too. Loved the recipe! I’m a huge basil and garlic fan. This was one of the MOST DELICIOUS meals I’ve served in a very long time! Thank you so much for the great recipe! My husband, who is NOT a fish eater, thoroughly enjoyed it too! I added a red onion. I prepared this meal tonight. The only thing I did differently is add about a cup and a half of spinach and 4 ounces of cream cheese. It was really good and had just a tad bit of heat. I served it over basmati rice with a side of sweetened cooked carrots. 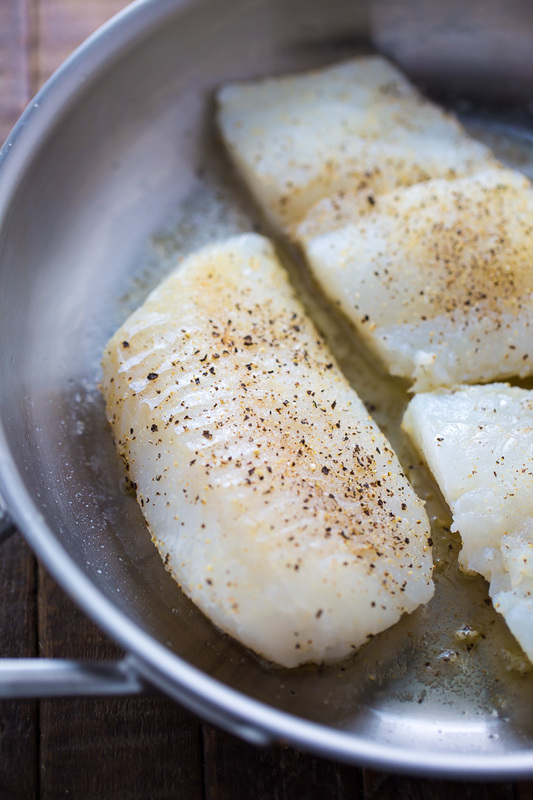 This is our “go to” recipe for cod. My husband does NOT want me to use any other recipe. Yay! LOVE it! That’s so awesome to hear! Thank you for letting me know how much you’re enjoying this recipe 🙂 Made my day! Very good fish recipe. Loved how the cod came out. I made this in a well seasoned cast iron pan It worked fine. My husband isn’t a huge fan of fish, but he went back for more. So happy you and your husband enjoyed this recipe, Cathy! I made this tonight with Mahi-mahi. I made one change (I hate when people say this, lol) as I didn’t have the fresh tomatoes. I substituted them with a can of diced tomatoes with garlic and herbs seasoning. My husband loved it!! I was instructed to save this recipe. This coming from a fishing guide Captain says a lot! Making this tonight – looks incredible. Have a special evening planned and this is perfect. I made this last night. It was impromptu so I didn’t have everything. I had to improvise on a couple things, I used a sweet instead of dry wine., I used canned diced tomatoes instead of fresh.